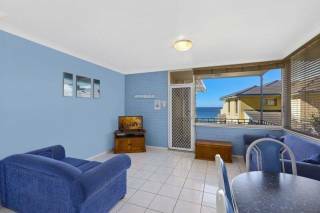 This absolute beachfront apartment provides spectacular views of Blue Bay Beach and Toowoon Bay Beach and has direct beach access. The property offers everything you need on a relaxing holiday and accommodates up to five guests. In addition to modern furnishings, it is equipped with air conditioning, microwave, dishwasher, washing machine, dryer, large plasma TV, Radio/ CD/ Ipod playing system, DVD player, Foxtel, WI-FI. 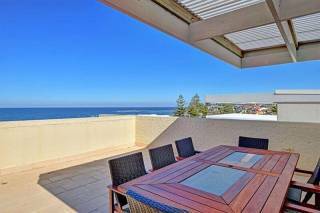 It has a large balcony (45sqm) directly overlooking the beach with 180 degree views. The complex has a pool area, BBQ Area and security parking. Blue Bay is just 75 minutes from the Sydney CBD. 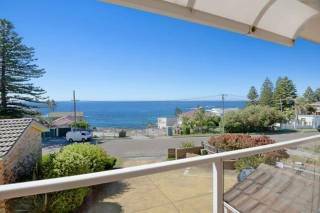 The unit is on Ocean Parade. It is only a five minute stroll along the beach to the world class dining facilities of Kim’s restaurant. 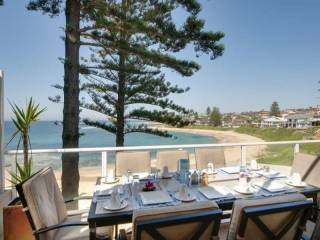 Kim’s is one of the best dining spots on the NSW Central Coast and is also right on the beach. In the opposite direction, and an even shorter walk along the rocks, is another beautiful restaurant on the cliffs overlooking the sea. For a smaller snack, the Toowoon Bay Surf Club cafe is about a 10 minute walk along the twin beaches of Blue Bay and Toowoon Bay. The best feature of this absolute beachfront apartment is the beautiful natural surroundings and the peace and tranquillity of the ocean. The beach views are ever present at this beautiful seaside retreat, which offers amusement and serenity all year round. The beachfront directly in front of the unit is a popular spot for small children with natural pools sheltered by the rocks and a sheltered beach at the northern end. The many rock pools in a huge rock platform, visible in the pools from the balcony, offers endless amusement for small children. Fisherman can drop a line in closer to the edge of the rock platform. Colour birdlife can be seen at eye level in the large pine trees. A minute or two along Blue Bay beach is stronger surf. And for even stronger surf, teenagers may want to go to the patrolled surf of Toowoon Bay Beach, which can also be seen from the balcony of the unit. The beach has been voted the cleanest beach in NSW. The south side of Toowoon Bay beach is renowned as a sheltered snorkelling spot with an abundance of marine life. This retreat offers peace and tranquillity. However, when you want a little more action it is a 15 minute walk to The Entrance Shopping centre with its associated plaza area, hotels and cafes. The Entrance offers live entertainment, board walks, more beaches, shops and childrens playgrounds. Daily pelican feeding is a popular local attraction. Cruises of the lake depart from The Entrance Jetty. The entrance offers deep sea fishing, or just in the channel, bike tracks, a skate park, golf and the rest! Gas BBQ - Complex BBQ Only.